To-do lists help you plan each day. If you already use Tasks in Yandex.Mail, they will be automatically displayed in Yandex.Calendar. To open the To-dos panel, click in the upper right corner of the screen. In the to-dos panel, click Create to-do list at the bottom, give the list a name and then press Enter on your keyboard. To change the name of a list, hover your mouse cursor over it and click . You can delete a list by clicking . Click the list you want to add a to-do to to expand it. Enter a name for the to-do and, if necessary, give it a date. If you have completed a to-do, you can remove it from the list by clicking the to-do, then clicking to the left of the to-do's name. The to-do will then be moved to the Completed tab in the to-do side menu. 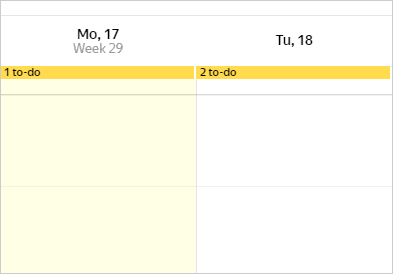 If you have accidentally marked a to-do as completed, then you can check the box next to its name again and it will return to its previous state. To-dos that have missed the date set by you will be highlighted in red and will appear in the Expired tab in the to-do side menu. Hover your mouse cursor over it and click . Click and hold to the left of a to-do, then drag it to the desired position in the list. Click in the upper right corner of your screen. In the To-do notifications section, check the boxes marked Send message with planned to-dos at <time> and Send message with expired to-dos at <time>. You do not need to check both boxes if you need only one of them. Set your desired time for notifications.